I’ve been interested in mushrooms for a while and once even grew my own shiitakes on a log, a hobby that I’m planning to return to. But I’ve become a little more interested ever since picking up A Cook’s Book of Mushrooms (ACBOM) while I was in New Orleans. Who knew there were so many types of mushrooms! After perusing it on the drive home, I began wondering how many of these exotic mushrooms I would be able to find in the grocery stores of Jackson, Mississippi. The answer: Not many. But on a recent trip to Kroger I found that in addition to the ubiquitous white mushrooms, portabellas, and shiitakes, I could in fact sample some Maitake and Beech mushrooms, so I grabbed 4-ounce packages of both and put them in my cart and then in my fridge…where they sat and sat while I tried to figure out what to do with them. I consulted ACBOM, but it was pretty uninformative about beech mushrooms, referring to them only in passing as a look-alike of an uncultivated Japanese mushroom, shimeji, and including no recipes for them. 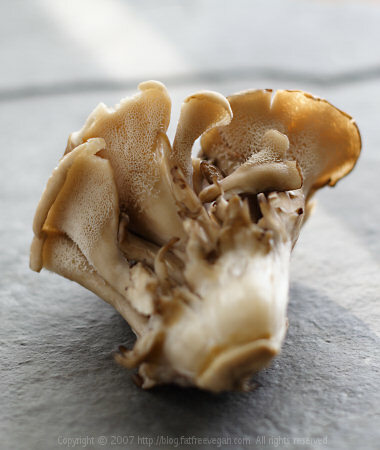 Maitake mushrooms, also known as Hen-of-the-Woods, received a little more attention, one recipe and this statement: “The flavor is mild and goes well with smoked meats such as sausage and with cream sauces for pasta.” Oops. I didn’t intend to use them in either of those ways! Fortunately, these mushrooms go with a lot more foods than this book gives them credit for. But a 4-ounce package of mushrooms will not go very far in any recipe, so when coming up with this dish, I used both the beech mushrooms and maitakes. Of the two, I found that maitakes have a stronger, more woodsy flavor, but I enjoyed the firm texture of the beeches. Both were absolutely delicious stir-fried along with some green beans, though I could see substituting other types of mushrooms for them. To use both mushrooms, I simply pulled them apart at the base. This is pretty obvious with the beeches, which are individual mushrooms joined together at the bottom, but the maitakes may be a little confusing to handle at first. Their rippling fronds are pretty delicate, so I just cut through the base enough to be able to separate them into manageable pieces. And in case you’re on the fence about mushrooms, maitakes are being studied for their possible cancer-fighting and imune system-building properties. And all mushrooms contain a variety of powerful phytochemicals and antioxidants whose disease-fighting properties have yet to be discovered. So eat up! Make these recipes in the reverse order that they are listed. Put your rice on to cook about an hour before you plan to eat. 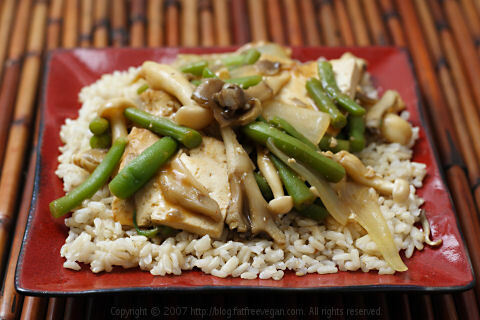 Then, chop the vegetables and mushrooms, and cook your tofu. When it’s done, make the stir-fry, which should be ready at the same time as the rice. Spray a large skillet with a light coating of oil and heat it on medium-high. Add the green beans and 3 tablespoons of water and saute for four minutes. Add the onion and cook until for another 3 minutes. Add the garlic and ginger and the mushrooms and cook, stirring gently, until the mushrooms are tender, about 2 minutes. Add the prepared tofu (below) to the pan. Mix the water with the soy sauce, cornstarch, sugar, and chili sauce and add it to the pan. Stir and cook until mixture thickens. Serve immediately over sesame rice. Cut the block of tofu into pieces about 1/2-inch thick. In a large skillet, mix the broth with the sesame oil and soy sauce. Add the tofu and bring to a simmer on medium heat. Cook for about 10 minutes, or until sauce has almost all evaporated. Gently remove the tofu and place it on a plate. Cover to keep warm until ready to use. Put all ingredients into a pot and heat to boiling. Cover and lower heat to a simmer. Cook for 40 to 50 minutes, until water is absorbed and rice is tender. (You may also do this in a rice cooker.) Keep warm until ready to use. Makes 6 to 8 servings. Based on 6 servings, each serving contains 339 Calories (kcal); 7g Total Fat; (18% calories from fat); 15g Protein; 58g Carbohydrate; 0mg Cholesterol; 542mg Sodium; 5g Fiber. Yummy recipe ….. I dont eat mushrooms and cook them only for my husband. 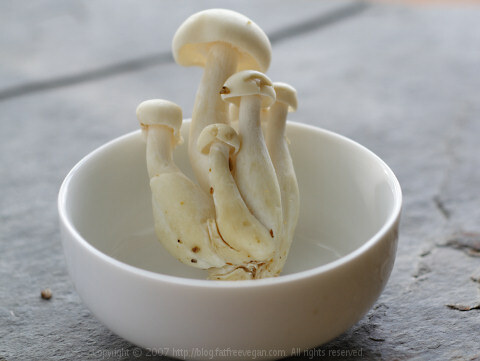 Recently he picked up Beech Mushrooms from Whole Foods Market and I didnt know how to cook them. I searched on the net and got your recipe. I used your basic recipe, made some small changes but the end result was so tasty. I couldnt help myself taking a bite. You have a wonderful blog … I am going to follow you regularly.